IT MAY BE TEMPTING TO SKIP A DENTAL checkup now and then. But remember that regular checkups and professional cleanings can actually save you time and money. 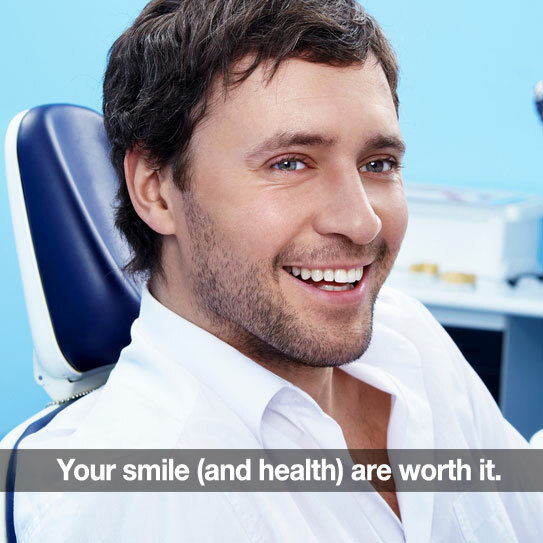 Even more importantly, they can save your teeth and your health. Catching tooth decay early can save your teeth. And speaking of saving teeth, did you know the greatest cause of tooth loss in adults is gum disease? About half of adults over age 30 have some degree of gum disease. Regular dental appointments help prevent gum disease, and assist you in managing any oral health issues you may be having. During professional cleanings, built-up tartar and calculus is removed that simply can’t be reached or removed by brushing alone. When you’re finished your smile feels truly fresh and clean. And by the way, regular cleanings can also help prevent embarrassing bad breath! As many as 120 systemic diseases can be visible in your mouth. Regular checkups can reveal the signs of diseases before even you know about them. Great dental care can also contribute to great overall health. In a study conducted at the University of California, Berkley, it was found that women who get regular dental care cut their risk of heart disease by a third. And in another study by Aetna, researchers learned that people who had regular dental care had lower healthcare cost burdens—thanks to prevention and early detection. One of the most important parts of each dental visit is your oral cancer check, where your mouth is surveyed for early signs of one of the very deadliest cancers. Questions? Always Feel Free To Ask! If you ever have any questions about recommendations for your regular dental appointments, please ask! Thanks for being a valued part of our practice!